The project is located in Orhangazi Square, in Bursa-Turkey which was the capital of Ottoman Empire in 1330s. Consequently, being an important center for trade and socio-cultural activities, the site is edged with historical buildings and monumental trees mostly from the Ottoman Empire. There have been several designs realized for the site since 1330s, the last one being in 1985. The revitalization of this old town center aims to clear the area off the noise and perplexity coming from the neighboring main road without damaging the historical environment. 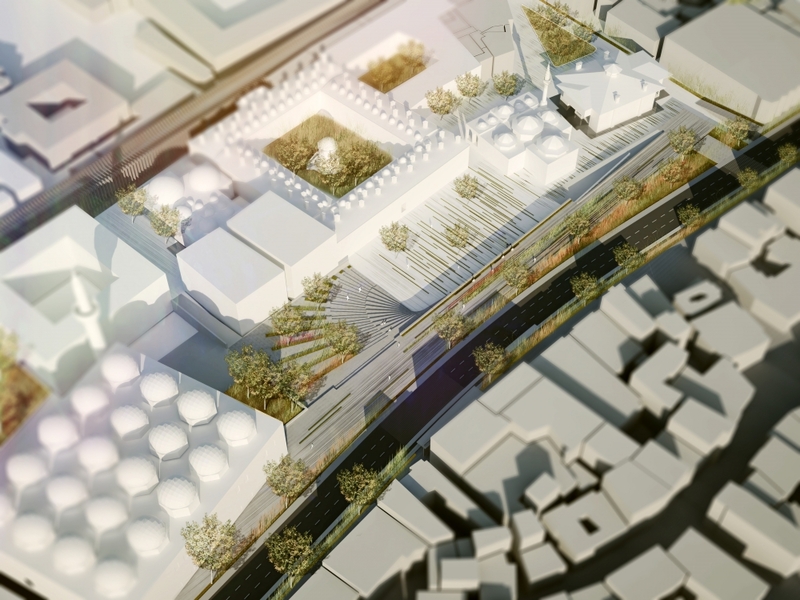 To restore the site’s importance as a focal point for commercial activities is another goal for the design. The square is planned on two levels, upper level enabling the continuation of transit pedestrian circulation and lower level reserved for recreational and cultural activities. Unlike the multipartite structure of the current situation, two levels are connected through massive urban stairs located next to Great Mosque. Defining strictly the entrances to the square, the urban stairs also detaches the square gradually from the busy road located on the upper level. The stairs are designed as a rich urban space enabling a variety of urban experiences. The vertical circulation is also arranged by ramps to facilitate accessibility for disabled people. The historical importance of the site was a very powerful input for the project, so all design decisions were taken accordingly. Large masses which would compete with the architectural aesthetic of the historical buildings were avoided. Therefore the café and the art gallery were located underneath the upper platform, in relation with relatively static lower square. The upper level contrarily is designed as a dynamic speed landscape for pedestrians intended for historical experiences.